Desert Mountain members enjoy a casual southwestern lifestyle offering social and recreational events to share with family and friends. Named as one of the “World’s Best Golf Communities” in 2000 by the Robb Report, Desert Mountain continues to receive awards and recognition not only for the community, but for its golf courses, clubhouses, retail outlets and the architecture of the homes that are built here. 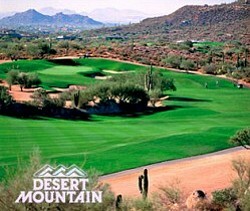 The Desert Mountain Club include six Championship Jack Nicklaus “Signature” Golf Courses that rank among the best in the world, and six distinctive, award-winning Clubhouses offer acclaimed golf shops and a variety of dining experiences. We have an extensive, Sonoran Fitness Center and Spa facility that rivals those of the finest resorts and health clubs with a full array of exercise and training options, and spa treatments. The Southwest’s finest tennis facilities, considered the “Wimbledon of the West,” feature three playing surfaces: grass, hard composition and clay courts.